This course meets the American National Standards Institute (ANSI) for Ropes Facilitator Training. For more information please read this article. All training also refers to American Camp Association (ACA) Accreditation Standards, Association for Challenge Course Technology Standards (ACCT), Professional Ropes Course Association (PRCA) and Maine State Licensing Regulations. Mike and his team at Adventure Mas are also available for building and inspections. Mike will also be at the exhibit hall at the ACA New England conference. Please contact us at [email protected]onic.com for details. Purpose: Learn facilitating techniques for various high elements and safety and rescue skills. Gain knowledge in risk and course management. Purpose: Focus is on facilitation techniques for both element/initiative and non-element/initiative challenges as well as safety skills. 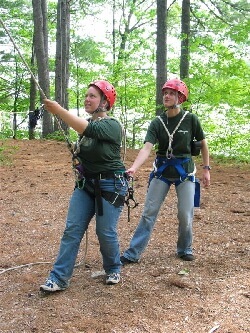 There is a discount price if a participant enrolls in both the High and Low Ropes Facilitator Trainings back to back. Please note that the Ropes training is a full time commitment, including evening classes and coursework. Purpose: Learn facilitation techniques, belaying skills and safety for climbing wall structures. Gain knowledge in risk management.